Companies that focus on D&I have higher levels of employee engagement, innovation, and retention. 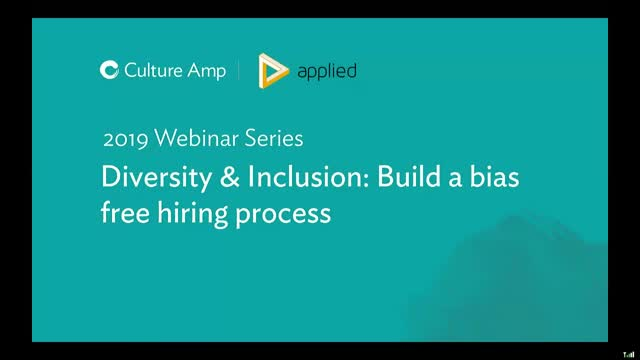 Join Culture Amp and our partner Applied during this 25 minute webinar, the fifth in our January series, to learn more about how you can use data to drive your Diversity & Inclusion strategy. Removing bias from your hiring process sounds like a myth. It’s not. Hear Melissa and Kate discuss how you can use behavioural and data science to make recruitment smarter, fairer and easier. Melissa will also share the latest findings from Culture Amp’s Diversity, Inclusion and Intersectionality report. Diversity and Inclusion are not new concepts, but as we look to an increasingly intersectional future, many growing businesses are considering their approach. Some Diversity and Inclusion strategies sound great but are harder, in reality, to implement and many just feel like 'checking the box'. This is a new field full of challenges, so embedding D&I in your culture's architecture early on will ensure your organization has a diverse and inclusive culture as you grow. This instalment brings research and customer experience together to look at ways Culture First organisations make D&I an important pillar in their organisational culture. Join Dr. Jason McPherson, Culture Amp's Chief Scientist, to hear about our research in predicting employee turnover and how we're bringing this capability to companies of any size. Building an organisation that is culture first has never been more challenging, but it starts by laying essential foundations that support the navigation of rapid growth. This requires the right HR stack to match your business, culture, and strategy. With the tensions that emerge between the ideal culture you want to create, and the practicalities of growing a business, we will consider how to implement, manage, and evolve your HR stack to support your journey. Key moments across the employee lifecycle can have huge and lasting effects on how proud, motivated, and committed employees are. It’s crucial to understand the moments that matter to employees, and how to make them as positive and impactful as possible. Join Culture Amp and Mo to find out the state of play across Europe and what we can learn from other Culture First organisations. We will discuss what makes employee experiences memorable, as well as ways you can elevate key moments to recognise and delight your people. By now, most startups or rapidly scaling companies realize that culture is one of their few sustainable business advantages. Investing in people and culture first – are a means to financial success. How do you ensure that as you grow, your culture keeps the essence of your identity, mission and values alive while evolving to reflect the changing make-up of your workforce, business offering and the world of work? In the kickoff to our Architect Series for 2019, we’ll focus on what it means for people leaders to be ‘architects’ to proactively and intentionally design a work culture that evolves with your business. We’ll also examine the tools and activities to implement culture by design. HR and People strategies are always evolving. We’re far from the days of traditional annual surveys, and more companies are starting to embrace the idea of continuous listening strategy. Similar to building a culture of feedback, continuous listening means gathering feedback more often across the employee lifecycle. Always listening to your employees often results in people feeling ignored. Here, we’ll explore the definition of continuous listening strategy, how it’s enabled by technology and in-person feedback, how companies have found success with frequent feedback and how you can get started. In an increasingly busy working world, more is being expected of employees than ever before. Some people spend more than 50 hours per week at work - and this can lead to a stressed and burnt-out workforce. However, organizations who encourage workplace wellbeing are creating motivated, engaged, and productive employees. Are your employees set up to survive in this working world? On March 20, Join Culture Amp and Virgin Pulse for a replay of our discussion about the importance of wellbeing in avoiding burnout. You will hear from Dr. David Batman, a registered medical practitioner and specialist consultant in occupational health, as well as Chloe Hamman, Director of People Science at Culture Amp. Following the 45-minute discussion, Dr. David Batman will be taking questions LIVE from the audience, with Craig Forman, Sr. People Scientist at Culture Amp moderating. Hear how Fitness First support an enormous retail workforce through various initiatives that build employee wellbeing and connection - whilst sharing the impact it has on their business. Join Culture Amp as we interview Lululemon to hear about theifr wonderful wellbeing strategy in Australia and New Zealand. Join Sophie Vanderkelen, Regional Manager Victoria, discuss these various initiatives and how they’re empowering a culture that supports mental health. Learn why this topic is now an important business imperative for any size of organisation as we uncover our latest research. Join Lead People Scientist, Chloe Hammon - dig into our findings gathered from various culture first organisations. In the competition to hire and retain top talent, a strong employer brand is the difference between the best and all the rest. Join this webinar, hosted by Glassdoor and Culture Amp, to learn how you can leverage the untapped power of your employer brand to help make your next hire the best yet. Co-author of New York Times bestseller “Primed to Perform” and co-founder and CEO of Vega Factor, Lindsay McGregor, alongside Culture Amp Founder and CEO, Didier Elzinga, are here to talk about high performing teams - and how to improve employee wellbeing along the way. With enough time for Q&A, they will share levers that can be addressed so you can walk away with steps to improve company performance. Technological advances are disrupting the status quo and bringing huge turmoil in their wake. Industries are converging, and new competitors emerging, as never before. The nature of work is changing and demand for digital expertise is soaring, while other skills are becoming defunct. Join Culture Amp and Innovid for a discussion on how to make better decisions with people analytics, build a culture of innovation to stay competitive and explore how global organizations deal with cross-cultural differences through data. Businesses globally are constantly being challenged to ‘deliver’ innovation, to be ever more creative. It’s not as simple as having an ‘innovation team’ or ‘innovative’ being a company value so how do you stay in front? We will share examples of how customers are creating a culture that fosters innovation. Leadership & Development is a top driver of engagement and retention, however it often seems that the best development tools and opportunities are reserved for senior employees. How can you ensure every employee in your business has access to the things they need to learn and grow? This webinar, the third in our January series, will focus on; why this topic is now an important business imperative for any size of organization or industry; how businesses are making L&D accessible to all employees; and the impact this has on your business. Join Culture Amp, Moneysupermarket and Enboarder for a discussion of how organizations are using feedback to create exceptional experiences across the employee lifecycle. Moneysupermarket will share their people strategy, approach to flexible working, investment in career development and how they’re empowering a culture that supports mental health. They will also cover their approach to a new system of onboarding with Enboarder. The most successful companies use people data alongside other data types (sales, marketing, operations data) to fuel their business strategy. Culture Amp supports organizations to uncover the areas of focus to ensure they have the right data to make strategic decisions. This webinar, the first in our January series, will focus on; why this topic is now an important business imperative for any size of organization; the importance of having an employee feedback strategy; 5 simple steps to start your feedback strategy; and how (and why) to customize your approach. Condé Nast is one of the most important and influential media companies of our time. Each day, more than 120 million consumers interact with Condé Nast’s iconic titles which include brands like Vogue, Vanity Fair, Glamour, GQ, The New Yorker, Wired, Allure, and Pitchfork. During this webinar, you’ll hear from Mike Boudreau, Executive Director of Community and Employee Success, on how Condé Nast uses rapid experimentation and lean startup thinking to measure, learn, and act on employee feedback. You will also have an opportunity for a Q&A session with our resident experts.